Favorite Credits: An international site-specific play Euphoria: Something Better Is Coming in Tbilisi, Georgia. "Augie, Alone" web series. Writing for The Blue Man Group. Why theater? : I’m involved in theater, film and television, but there’s an intimate and immediate connection between audience and performer in live theater that you just don’t get in any other form. It’s a good thing to feel that knot in your gut as you watch an audience react to your work in real time. It’s as pure a connection between artist and viewer there is, I think. Tell us about Looking Back, It May Not Have Been Ridgefield High’s Best Production Of Our Town: The play follows a playwright as he returns to his high school’s gymnatorium the night before it’s torn down. He gives us a tour of the building, while the gymnatorium itself remembers the lives of the students and families that were in some way touched by the building—and by the many productions of Our Town that have been produced there. It’s a play about respecting the past, but trying to keep an eye towards the future. It’s sad and funny and sometimes both at the same time. What inspired you to write Looking Back, It May Not Have Been Ridgefield High’s Best Production Of Our Town? : It started back in 2010 as a possible site-specific follow-up to the play I did in Tbilisi. As the show developed, I became a character in it, and it all became a lot more personal—probably more personal than any other play I’ve written. I was interested in writing about that time that everyone goes through, the awkwardness of growing up and the need to look back to the wisdom of old plays and artworks to look for what it means to be human. The play was dormant for a few years after I wrote it as my NYU thesis, when my good friend and director Isaac Klein re-read the script and encouraged me to pick it up again. He’s helped guide this play towards our first production and I’m so excited about where it’s going. What kind of theater speaks to you? What or who inspires you as an artist? : I’ve always found theater to be an opportunity to open yourself up and find honesty. I’ve been inspired by the works of Chicago artists like The Neo-Futurists, The House Theatre of Chicago and Sean Graney and The Hypocrites. In New York the works of Elevator Repair Service, Taylor Mac and The Debate Society really speak to me. I think they do fearless, honest work. I like plays that continue to hold a mirror up to life and each of those groups or artists do that in way that is uniquely and beautifully them. If you could work with anyone you’ve yet to work with, who would it be? : I’d love to work with any of the companies I just mentioned, but I’ve always wanted John C. Reilly to act in a play or anything I’ve written. 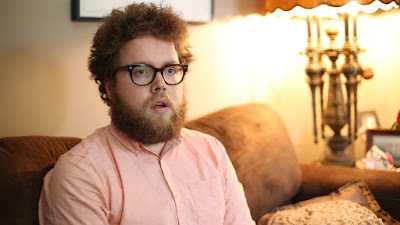 I think he knows how to become a character in comedies and dramas and make even Dr. Steve Brule incredibly empathetic. I see myself in every character he plays and that’s entirely his talents. What show have you recommended to your friends? : Oh, Hello and Natasha, Pierre And The Great Comet Of 1812. Both are shows that are better diving in unknowing—which is how I saw them both. I have yet to see Natasha… on Broadway, but I caught it at Ars Nova and saw the magic of how they transformed space and time to make something spectacular. Oh, Hello caught me by surprise—you never know how a sketch is going to stretch out and I went in unsure, but that was stupid of me. Nick Kroll and John Mulaney are comedic geniuses and there’s nothing better than seeing people have fun on stage and that’s what that show is all the way through. I’m going to see it again next week with my family. If you could go back in time and see any play or musical you missed, what would it be? : I think I’d go back to see a play in ancient Greece, probably one of the non-surviving PROTEUS by Aeschylus. I think it would be fun to see the dawn of drama. More recently, I wish I’d gone to Taylor Mac’s A 24-Decade History of Popular Music. What’s your biggest guilty pleasure? : Reality Television and Reese’s Peanut Butter Cups. At the SAME TIME. If you weren’t working in theater, you would be _____? : I started at UChicago pre-med, so maybe I would’ve become a doctor. That’s a frightening thought, though. I’d probably still be trying to pass Organic Chemistry. What’s up next? : I’m working on a couple of different television projects right now and going forward with those projects next, but we’re looking to and hoping to have continued life with this play.